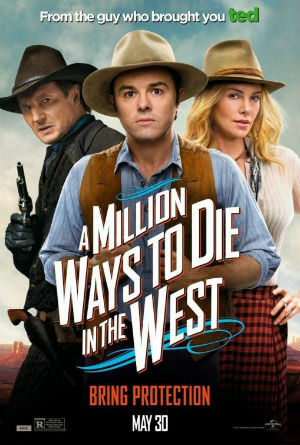 Earlier this week I watched A Million Ways To Die In The West (2014) by Family Guy creator Seth McFarlane. I remember watching the trailer a couple of years ago, but I also had a lot of friends tell me that the movie was disappointing and unfunny. Looking for a dumb comedy after a long day of snowboarding, we decided to check it out. As a fan of Family Guy and Ted, I was expecting some hahahs and a couple of dirty jokes, but little more. It's 1882. Albert (McFarlane) is a sheep herder in the town of Old Stump, Arizona. When he is dumped by his girlfriend Louise (Amanda Seyfried) for withdrawing from a gun fight, he prepares to leave for San Francisco. Meawhile, outlaw Clinch Leatherwood (Liam Neeson) robs and kills a prospector for a gold nugget, ordering his right-hand man Lewis (Evan Jones) to take his wife Anna (Charlize Theron) to Old Stump to lie low while he continues his banditry. Lewis is quickly arrested for shooting the pastor's son in a saloon brawl, after which Albert and Anna becoming good friends. A Million Ways To... certainly boasts some moments of wit and its many cameos are entertaining also, but overall, McFarlane's comedy western is in fact an empty non-comedy. This is Adam Sandler territory, right here.